Pub in Holborn converted from a former restaurant, and run by the same people behind the Euston Tap. Inside, the space is broken up by columns and is fitted out entirely with high tables and stools, with most tables large enough for around 4-5 people. The polished floors and lack of decoration mean the noise bounces around the space, and hence it gets very noisy when the after-work drinkers are in (elvum used a smartphone app that claimed it was ~82dBa on a Wednesday evening in June 2013 - loud enough that the bar staff should probably have been wearing ear protection). On a Thursday evening in December 2012, no music was playing, but it was very busy, even at the very-post-work hour of 10pm (though this may have been partly due to the proximity of Christmas). The experience on a Wednesday evening in June 2013 was similar. 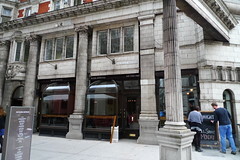 The bar is built around a large central pillar into the bricks of which are fitted gravity taps for cask ales, keg beers and ciders on three sides photo. These are all chalked up above the taps (repeated on each side), and are constantly changing. Standard prices for cask ales as of June 2012 seem to be £3.40 (with higher alcohol brews such as Thornbridge Jaipur a bit more pricy). Brewers such as Williams Bros and Dark Star are heavily represented, and Ewan tried a Williams Brothers Scottish Joker and Dark Star Sussex Extra Stout on cask, as well as a Black Isle Porter and a Kostritzer Schwarzbier on keg, all of which were well-kept and served. On a return visit, a pint of Bernard Dark lager (£3.60) was excellent and nicely presented in a branded glass photo. There is an open kitchen down some stairs at the back of the pub (which customers will pass on the way to the toilets); as of June 2013 the menu consisted of burgers, pizza (£6.50-£7.50) and steak sandwiches (menu updates are posted to their Twitter account). Accessibility: Toilets are in the basement. There's no normal-height seating inside, just high stools. See also note above about noise. Last visited by bob, June 2015. Last edited 2018-11-10 14:07:25 (version 15; diff). List all versions. Page last edited 2018-11-10 14:07:25 (version 15).